Once upon our modern-day times, a new symbol to express awareness of gratitude for freedom, that honors those who serve our nation and beyond, was born. In 2005, the first inspired sketches of the Dog Tag Ribbon symbol were drawn. It took shape over time and eventually materialized into a Project Join Us trademarked symbol, and now has become a collectible pin. In 2003, Diana Anastazia, the daughter of a Polish Catholic Holocaust Survivor of Auschwitz and Buchenwald, along with her friend Mendy Hart, a Rabbi’s wife, began prayers for 7 POWs in Iraq. 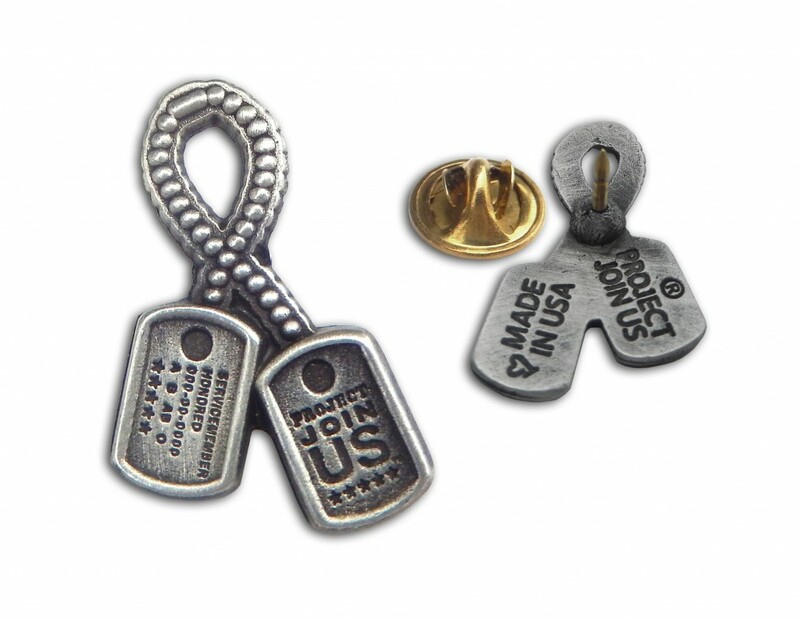 That sparked the beginning of a faith-filled journey for Diana, which eventually led to the designing of the Dog Tag Ribbon symbol and the founding, in 2009, of Project Join Us, a company where design meets meaning and honors gratitude for freedom. 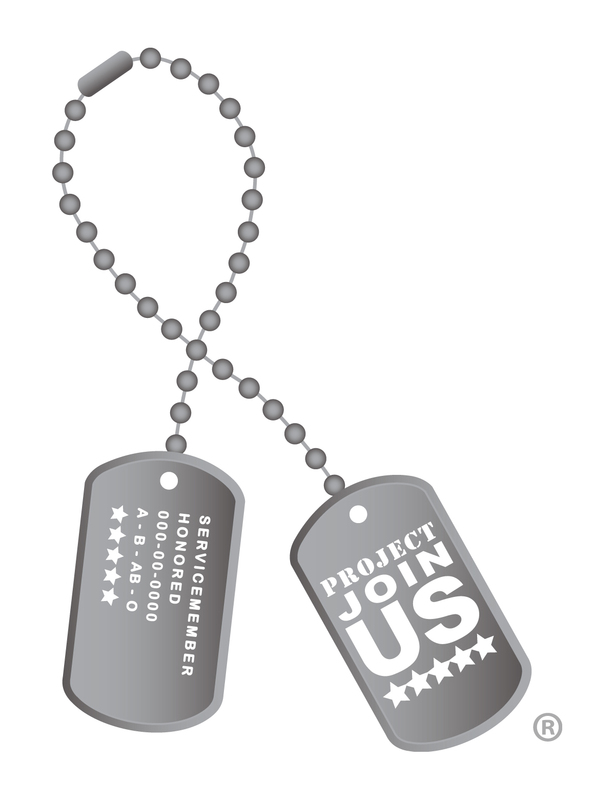 The Dog Tag Ribbon, an awareness symbol embodying “Gratitude for Freedom” is intended to connect civilians with the military. The design goal was to create a recognizable symbol, with deep meaning, which was new, fresh, and yet still classic. Combining the shape of an awareness ribbon and using dog tags was practical, knowing that dog tags are worn next to the heart, and are cherished by those who wear them when in uniform, and also by their friends, family, and other civilians. The perceived disconnect between civilians and the approximately 1% of the nation serving in the military, fuels the importance to realize we are all in this together. Project Join Us’ corporate motto, “Everyone of U is a part of US”, supports the importance of connecting US:All. This also means connecting the all the generations, past to present. While we still have some of the WWII generation with us, to be able to witness a civilian sense of gratitude for their service and the gift of freedom, we can truly make an impact on this Greatest Generation. In June 2015, for the 71st Anniversary of D-Day, PJUS friend and WWII hero of the Big Red One (first wave on Normandy), John Chrenka, was gifted the first approved prototype Dog Tag Ribbon Pin. 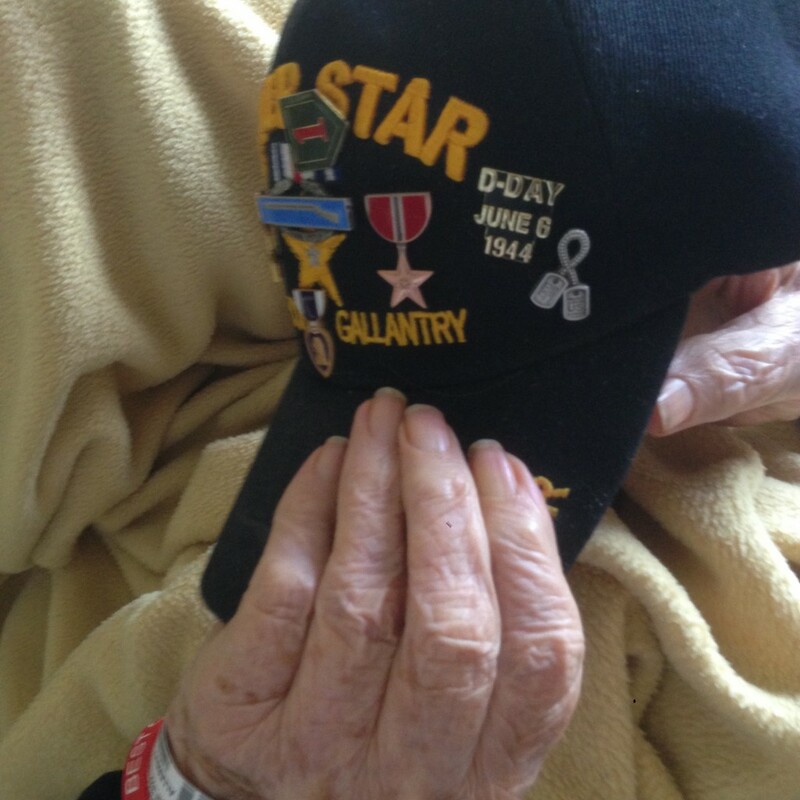 He proudly wears it on his Silver Star hat next to his D-Day pin, and when gifted the pin, this hero was reminded of, and with a smile, sang a song he wrote while serving in Europe, about being called a “doggie”, because of the dog tags service members wore in WWII. Many meaningful milestones have been entwined into the Dog Tag Ribbon symbol’s journey. On September 11, 2008, the symbol, along with the song Everyone, written for Project Join Us by David Young and Diana Anastazia, was present at the 9/11 Pentagon Memorial Dedication Ceremonies. July 4th, 2012 is the date that PJUS received official notice of approval of symbol trademark from the United States Trademark Offices. Now, in August 2015, during the 70th Anniversary of Victory Japan (VJ) Day and the commemorative year of the “Spirit of 45”, it is with heartfelt gratitude, that Project Join Us is honored to debut thier Dog Tag Ribbon Pinz. Furthering the PJUS mission to connect military and civilians, as well as all generations, the new Dog Tag Ribbon Pinz will be part of the Veterans Network Committee of Northern Illinois’ Honor Flight in August 2015, and will gifted to all participants, while in Washington D.C. With WWII, Korean, and Vietnam Veterans on this Honor Flight trip, it is especially meaningful to bring the Dog tag Ribbon symbol back to Washington D.C. and is a beautiful way to celebrate the introduction of this new Project Join Us product. Project Join Us’ vision of inspiring our Nation to express gratitude for freedom has included its commitment to Made in U.S.A, since day one, even when all the odds were not in their favor. They have created innovative, hand crafted and quality accessories, with green awareness, at affordable prices. In heartfelt gratitude for our freedom, you will find a heartprint on the back of every Dog Tag Ribbon Pin, as well as all PJUS products.